The government submitted to the parliament a draft State Budget-2019. The proposed document is an example of what the budget of a country, trying to emerge from poverty, should not be. The only positive moment in the draft State Budget – 2019 is that this is the last budget of the current authorities. To create for Ukraine and its citizens the prospect of qualitative improvement of the situation in all spheres of life, this draft law should be completely revised. And it is necessary to start with the economy. For more than four years, the Ukrainian industry has been struggling to survive in the most severe conditions, created for it by the authorities. Now we are offered the continuation of this course for another year. Total direct costs for the promotion and development of exports are offered at the level of UAH 158 million. This is 0.000009% of the expected exports in 2019 ($ 63 billion). The funds for stimulating investment attraction and supporting innovations will decrease from UAH 200 million in 2018 to less than UAH 178 million in the next. Financing of state orders and the National Target Scientific and Technical Program is being reduced by 16.7% in real terms. In such a fiscal policy, there is an answer to the question, why, after the catastrophic collapse of the economy in 2014-15, the rate of its growth in subsequent years is scanty 2-3%. In it, there is an answer to the question, why in the draft State Budget-2019 there will be an actual reduction of social expenditures. The proposed draft budget is antisocial. It continues the practice of the budgets of 2014-18, which cut real social standards, underfunded medicine and education, as a result of which millions of Ukrainians found themselves below the poverty line. In addition, the subvention plan for provision of housing and communal subsidies has been cut by almost a quarter – UAH from 71 billion in 2018 to UAH 55.1 billion in 2019. And this despite the fact that, firstly, even the amounts for the current year were understated (according to the results of the first 7 months 80% of the entire subvention was spent from the budget), and secondly, the authorities have already announced the growth of prices for gas and heating this fall and, most likely next spring. Who and from what funds will pay new tariffs without subsidies, if the planned overall subsistence level for 2019 from January 1 is 1853 UAH? Even according to official data, inflation for 2014-19 will be at least 170%, while the subsistence minimum even for December of the next year (UAH 2027) will be only 72% higher than that which was on January 1, 2014. The same applies to the minimum pension, which at the beginning of the year will be UAH 1 497, at the end – UAH 638. If it were indexed at least by the inflation indices of the last five years, its size at the end of 2019 would be UAH 2562. However, no one expects such a minimum pension from the current authorities. Inadequate indexation of social standards for inflation is the main reason that in the fifth year of the current authorities’ stay 47.3% of the population continues to be beyond the absolute poverty line. In 2014, the share of the population with expenditures below the actual rate was 28.6%. The authorities are proud to raise the minimum wage to UAH 4,173. However, this “minimum” – less than $ 150 at today’s rate – remains the lowest in Europe, below Belarus and Moldova, not to mention the countries of the European Union. Is there any incentive for Ukrainian citizens to work at home? The answer is obvious. Another obvious feature of the draft State Budget – 2019: it is prepared poorly and built on unrealistic forecasts. The planned rate of inflation – 7.4% – even before the beginning of 2019 looks absolutely unrealistic, since it does not take into account the consequences of the upcoming increase in tariffs for gas and heating, as well as consumer demand, warmed up by the growth of the minimum wage. Business, which assesses the situation more realistically, expects in 2019 inflation at the level of 10%. The current macro forecast of nominal GDP, built on such indicators, is understated by approximately UAH 150-180 billion, which leads to underestimation of possible revenues from taxes and non-tax payments to the budget in the amount of at least UAH 60-72 billion. Low inflation is a feature of the budgets of all the last four years. And its consequence is a regular underfunding of all benefits tied to the level of inflation. But in the current draft State Budged, there are items of expenditure that are not indexed to the level of inflation. For the fourth year, the volume of subventions for local budgets for medicines for ambulance has not increased (UAH 138 million). Since 2014, there has never been an increase in assistance at the birth of a child. In 2019, it will again amount to UAH 41,280, including a one-time payment of UAH 10 320 and subsequent monthly payments for 36 months at the level of UAH 860. In the draft State Budget, there are spending items that are not indexed to the level of inflation and are generally reduced. Thus, by 5.3% or by UAH 169 million, the cost of providing monthly targeted assistance to internally displaced persons is reduced to cover living expenses, including housing and communal services (in 2018 there were UAH 3.2 billion, there will be 3,03 billion). At 1.7% (from UAH 309.9 to 304.6 billion), the plan for transfers (subsidies and subventions) for local budgets is reduced, in fact, even the “decentralization”, which the government itself advertised, is actually being crossed. However, this applies to virtually all “reforms” in recent years: neither the education sector nor the health sector will receive the funds allocated to them under the laws adopted in 2017. The only thing that the authorities do not save on is the law enforcement agencies. Operation and maintenance of the activity of “siloviki” will grow by UAH 14.9 billion (or by 22.9%). Of these, the most rapid increase in spending on the apparatus of the Ministry of Internal Affairs and the police (+ 30.6% or +UAH 9.67 billion), the Office of State Security (+ 20.4% or +UAH 0.21 billion), State Border Service (+ 15.6% or +UAH 1.46 billion), SBU (+ 15.5% or +UAH 1.26 billion). All costs for the “siloviki” in the project (UAH 80.07 billion) are 12.7% higher than those of the educational subvention, and 45.5% for the medical subvention. At the same time, UAH 23.6 billion are allocated for the maintenance and support of the activities of the Prosecutor’s office and courts. And the costs for the Prosecutor’s office alone will amount to almost 7.2 billion UAH, which is more than 1.5 times higher than the budget of the National Academy of Sciences (4.7 billion UAH), although five years ago (in 2013) the expenses for the Prosecutor General’s Office and the Academy of Sciences were the same. The total defense expenditure and the rule of law will increase by UAH 31.5 billion (+ 27%) to UAH 209.5 billion (5% of GDP). For comparison, this is almost 2.3 times more than the cost of medicine. Every second hryvnia will not go for development, as is customary in countries that really care about their defenses, but on consumption. 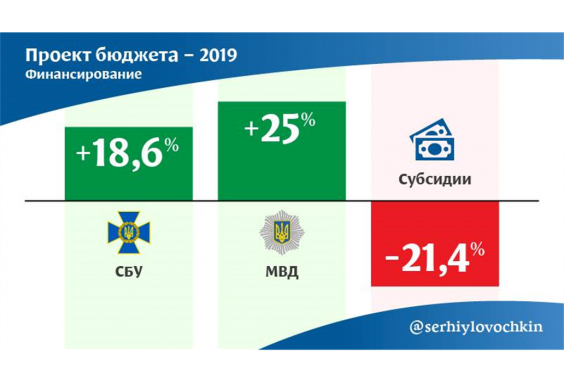 More than UAH 82 billion (24.4% more than in 2018) will be spent on the article “public security”, mainly to the police and other non-army law enforcement agencies. Almost 2 thousand hryvnia will be paid from the pocket of every Ukrainian for structures that are inactive, only by stimulating the rampage of street crime and banditry. The budget of Ukraine should be completely different. Finally, the state should prioritize a person. Restoring the economy and creating jobs, strengthening social protection of citizens – all this is possible already in the State Budget – 2019, after a review in the next year, after the elections.